The folks who cover and follow NASCAR are of course talking about the “Big Three.” Kevin Harvick has seven victories, Kyle Busch has six wins and Martin Truex Jr., has four checkered flags. They make up the top-three in Monster Energy NASCAR Cup Series points. But fourth on the list is Kurt Busch, driver of the No. 41 Monster Energy/Haas Automation Ford Fusion for Stewart-Haas Racing (SHR). Busch has 14 top-10 finishes and has been in the top-10 in points for 18 consecutive weeks, his longest such stretch since 2016. But he has yet to score a victory this year. Fortunately for Busch, the night race at Bristol (Tenn.) Motor Speedway is next on the schedule. Busch has five wins, 10 top-five finishes and 17 top-10s at the .533-mile concrete oval and has led 1,062 laps in 35 career starts there. He scored his first career NASCAR Cup Series win at Bristol in March 2002. He started 27th and led 89 laps en route to that maiden victory. It was only his third visit to the fast, high-banked oval, making him the only driver to record his first win at Bristol in fewer than four attempts. His five career Bristol wins – March 2002 and 2003, August 2003, March 2004 and 2006 – is second best among active NASCAR Cup Series drivers at Bristol behind his younger brother Kyle Busch, who has seven wins there. The elder Busch brother even completed a Bristol Cup Series sweep in 2003, winning both the spring and fall events. He started ninth and led 116 laps in March while starting fifth and leading 121 laps in August. In March 2004, Busch went on to record his third consecutive win at Bristol when he started 13th and led 119 laps on his way to victory lane. He is one of four drivers to win three or more consecutive Cup Series races at Bristol. Fred Lorenzen won three in a row starting with the fall race in 1963, followed by a sweep of both 1964 events. Cale Yarborough won four in a row with sweeps in 1976 and 1977. Darrell Waltrip won seven in a row, with sweeps in 1981, 1982 and 1983, then a win at the March 1984 race. 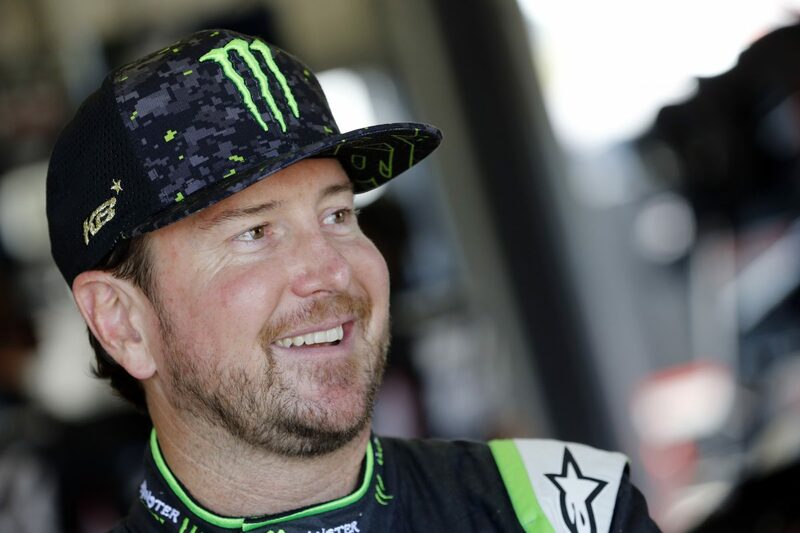 Busch has led laps in 15 of his 35 career Cup Series starts at Bristol and he has led more than 100 laps four times, including three consecutive races – 116 in March 2003, 121 in August 2003, and 119 in March 2004. He’s hoping that Bristol will be his first win of the 2018 season with the playoffs just around the corner. Talk about Bristol Motor Speedway – you’ve won there five times.